This IS130-2 Black PIR 130 Degrees Infrared sensor from Steinel is ideal for targeting areas in front of buildings, driveways and indoor areas. It has a 130 degree angle of coverage that will reach up to 12 meters. It also has a selectable twilight and time threshold. The sensor turns through 50 degrees and will tilt through 90 degrees to give precise adjustment in the detection zone. Targeted, all-round detection. Infrared motion detector IS 130-2, for indoors and out, ideal for targeted detection close to buildings, 130° angle of coverage, reach up to 12 m, selectable time and twilight threshold, sensor swivels through 50° and tilts through 90° for exact adjustment of the detection zone. Live life conveniently and save energy too. More quality of life, more safety and security and more energy saved with intelligent sensor technology from STEINEL. Light 'ON' / 'OFF' – automatically. Highly innovative sensors respond to movements and light levels, automatically switching the light 'ON' and 'OFF' again after a preselected time. The IS 130-2 infrared motion detector offering unbeatable value for money is one of STEINEL customers' favourites. We've now optimised it even further, both in design and technology. The IS 130-2 infrared motion detector is the ideal solution for watching over areas with precision targeting on buildings. 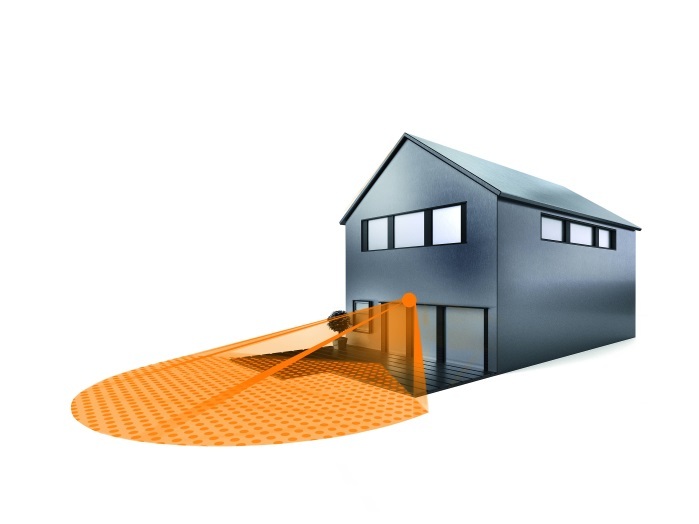 It provides an excellent quality of detection in areas of up to 150 m2. The detection zone can be matched exactly to the specific situation at the point of installation using the multi lens that swivels through 50° and tilts through 90°. The detection zone can also be limited by fitting shrouds that are provided. Time and twilight threshold can be infinitely varied at a control dial underneath the multi lens. Thanks to the generously sized and clearly arranged terminal compartment, the IS 130-2 infrared motion detector is wired up and mounted to the wall quickly and easily. The supply lead can be concealed or surface-mounted. The sensor success story. Still looks as stunning as ever. Are you looking for a way to enter the world of motion detectors? The IS 130-2 infrared motion detector is a STEINEL customer favourite of recent years, not meaning that we're resting on our laurels. We've continued to optimise both its design and technology. The sensor classic is the ideal solution for monitoring areas with precision targeting in front of buildings and on driveways. It also provides excellent quality of detection and can be tailored to the specific conditions on site. The motion detector is wired up so easily and quickly, your neighbour won't even notice you installing it.